Adapted from Gourmet, December 2008. If you like, par-boil the potatoes until about halfway cooked to give them a head start. 2If you're using bacon, lay the strips on a rimmed baking sheet and bake for 10-15 minutes, until crispy; remove the bacon and set aside, leaving all or some of the drippings on the pan. 3Spread the potatoes out on a single layer on the pan, and shake it around to coat them, adding a drizzle of oil too if you think it needs it. (If you didn't use bacon, just drizzle the potatoes liberally with oil and toss them about to coat.) Sprinkle with salt and pepper, bump up the oven temp to 450°F and roast for about 10 minutes, stirring once or twice. Stir in the sliced garlic and cook for 10 minutes more. Sprinkle with cheese and roast until cheese is melted and golden in spots, about 5 more minutes. 4Meanwhile, purée tahini, water, lemon juice, remaining garlic clove and salt in a blender until smooth. Add a bit of water if the sauce is too thick. 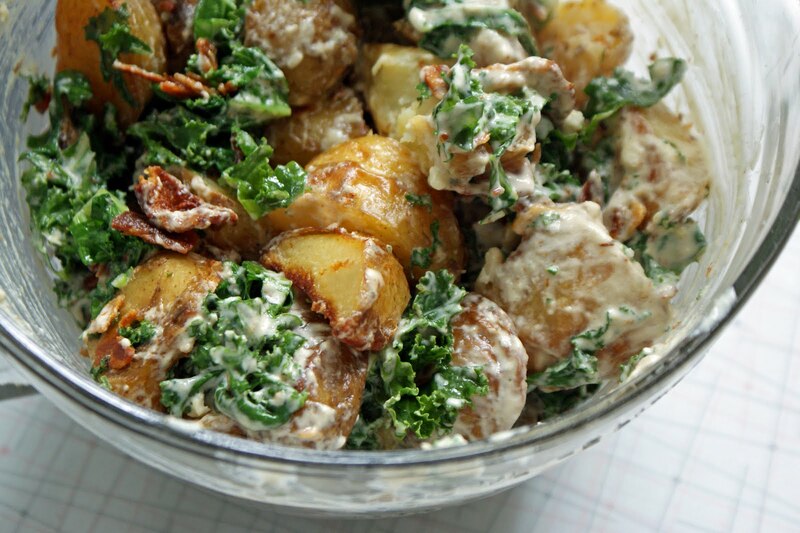 5Toss kale with hot potatoes and any garlic and oil remaining in pan, then toss with tahini sauce and salt and pepper to taste. Serve immediately.